Chrismas and Stress seem to have become synonymous. Life is frantic. Stress levels scream ever higher with alarming pressure. But there’s a swing back to a calmer way of being. Medical Science and especially Neuroscience are recognising the power of the ancient art of why mindfulness matters to create calmer happier lives. Imagine doing one thing differently that would open the door to being the person you would love to be. 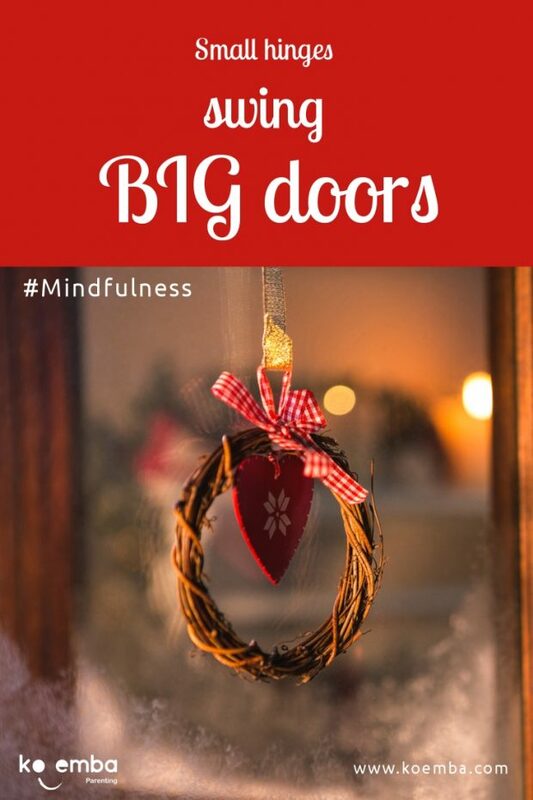 The hinge that opens that door is mindfulness. Mindfulness swings open the doorway to enjoying the moment, to greater understanding, to being tuned in to what is there before you. it opens our minds to what’s needed. Another word we could use to describe that mindfulness is awareness. 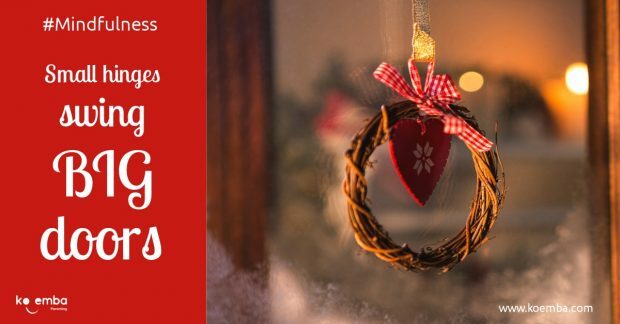 The good news is we can choose mindfulness in the everyday moments of our lives – it’s about choosing to be conscious, even in the run-of-the-mill events at a busy time like Christmas. Small hinges swing big doors. We can swing open the habit of mindfulness in the regular moments – whether we are peeling the potatoes, changing a nappy, opening a present, or whatever – just becoming more conscious of what we are doing in the moment. When we are mindful we become more conscious of what we are doing, what we are feeling, who and what is around us and with us. We notice our intentions. We become more conscious of the thoughts that wind us up and how we can let them go and choose a more helpful response. Instead of a “knee ‘jerk” reaction that is triggered by feelings of anger, fear or envy, we can respond with compassionate curiosity, that helps to create the quality of relationship we desire. Whether the house feels like world war three broke out or a home where you’re all glad to live can depend on whether we, as parents, choose to react or to respond. And our reactivity or calm response will depend on our mindfulness. If you’d like the chance to develop key insights and practical skills to mindful parenting click here to discover “Stop Yelling – nine steps to calmer happier parenting” with Val Mullally guiding you through this live online course. Choose to respond rather than react. Take a few breaths to calm yourself. Focus on choosing connection. In the next blog discover how to clear the mental clutter that adds to our stress and causes us to react, rather than respond in a way that builds healthy relationship. What small doable step will you take today to become more mindful in your everyday living? 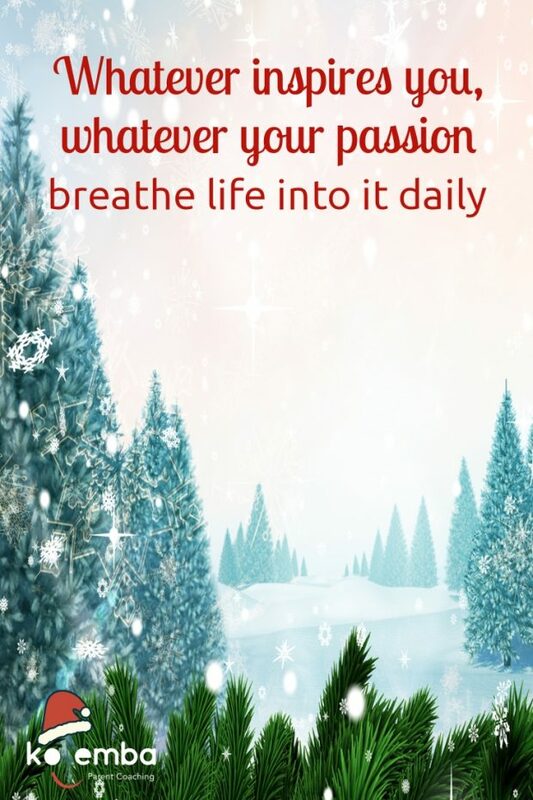 In the fourth blog of this CHRISTMAS series, Val Mullally looks at Inspiration – how to breathe life into your passion. What’s been your film of the year? For me, the film of the year has been the BBC documentary “Drowning in Plastic” presented by Wildlife biologist Liz Bonnin. We urgently need to do things differently. What about the mental pollution that we’re drowning in? Like the plastic in our lives, we initially think all this information and technology is useful, or fun, and we don’t realise how it’s seeping into every corner of our existence in ways that are toxic and destructive. Like the seabirds that are swallowing rubbish, are we unaware what we are ingesting? We don’t recognise how it’s strangling us – mental pollution that leaves little space for the psychological nutrients we need to thrive. 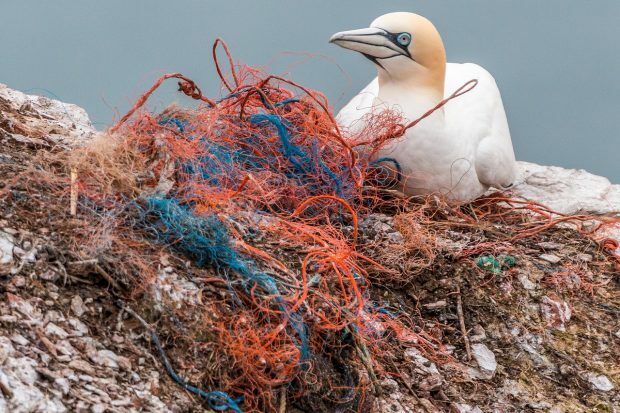 Like the seabird chicks with stomachs full of useless plastic instead of life-giving nutrients, are we gorged on negative news, useless trivia and manipulative advertising that screams we are not good enough. Not only does unawareness go with the territory, it is the territory. What can a person do? It’s time to stop the madness. Become aware. Notice what inspires you – what fills you with hope and joy. 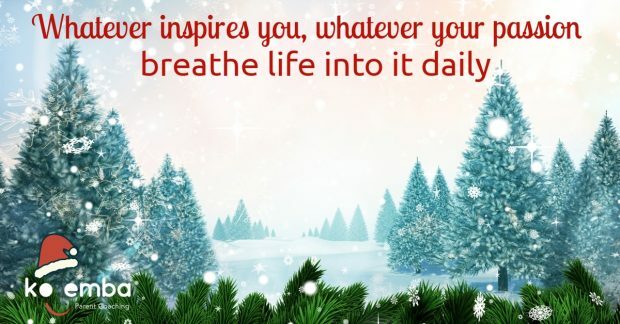 The root of the word inspire comes from the Latin inspirare – “to breathe or to blow into”. What dreams do you want to blow life into? Interestingly, in the paragraph above I accidentally typed “dreams” instead of “screams”. And it got me thinking – what is screaming in my life and how do I replace that with my dreams? It’s time to clear the psychological clutter. How do I substitute the mental pollutants with the things that inspire me? I know as a parenting author I have to deliberately and systematically create space and time to write. If I wait until I am inspired I would hardly ever write. It’s about getting my bum in the chair every day and beginning to write. Then Inspiration comes. Not only when I am writing, but, she whispers to me as I walk the dog. She nudges me as I iron a shirt or stir the soup. I’m attentive to hear her when I’ve given the first part of my day, while I’m at my freshest and best, to writing. Whatever inspires you, whatever your passion, breathe life into it daily. At a global level, we urgently need to do things differently. It’s not only about the supposed “big stuff”. When we follow our passion we each find our unique way of contributing to the greater good. Will you join me in breathing life into that dream? 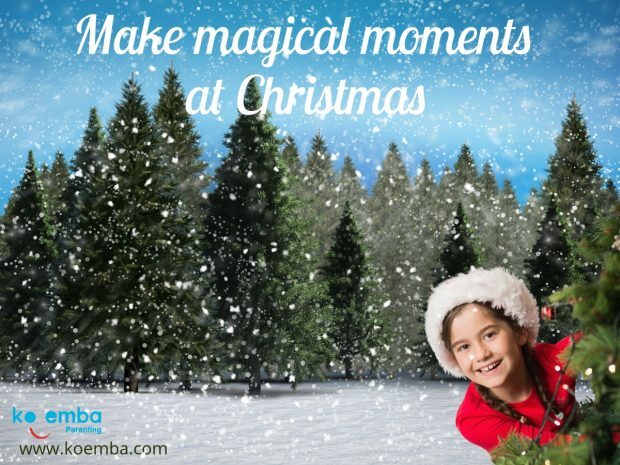 This Christmas let’s slow down and become aware of what matters. So it’s over to you. In what ways will you choose to cut the mental pollutants in your life? What things breathe joy and hope into your daily life? How can you bring more of these into your life in the year ahead? I raised my eyebrow. In my mind how could my friend not have seen her beauty. Claire has a fair complexion, smooth blond hair and neat features, and she has a radiance that makes me smile just thinking about her. So many parents despair because of their children’s constant bickering and fighting. Perhaps you are a parent in that situation too, concerned about the sibling rivalry in your home – perhaps you are wondering how to respond to sibling jealousy. Very often when anger surfaces there are feelings of fear or disappointment underneath the blanket of the aggressive behaviour. These emotions are fueled by envious, or jealous thoughts. Until we acknowledge and respond to our children’s feelings and thoughts, we are likely to find ourselves dealing with the fallout of sibling rivalry. The thing is, jealous thoughts are like woodborers – if they are ignored, they slowly erode the fabric of the relationship. Children often feel frustrated, irritable or fearful because they imagine they are at a disadvantage to the other. This statement says so much – when there is sibling rivalry at least one child is not feeling equal to the other. Perhaps your child’s envy is tied in more with admiration of his sibling than a feeling of resentment. We can’t stop the envy, but imagine if we could help our children to take ownership of their envy and to turn this around to be a helpful tool. Have you come across the term “frenvy”? It’s a term to describe “friend envy” – that sometimes we envy the character traits or achievements of the very ones we like. 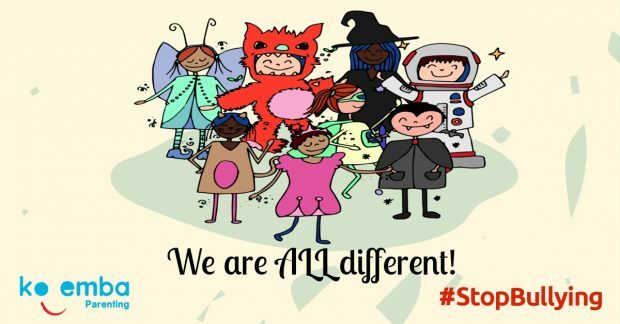 When we listen supportively we can help our children figure out what their envy is really about, and it can spur them on: “If she can do it I can too!” We can help them turn the green-eyed monster into a helpful ally – to be the best they can be. When there is strong sibling rivalry it is often connected to low self esteem. A key aspect to easing sibling rivalry is to build your children’s self esteem. To discover practical ways to boost children’s self esteem see 7 Useful Tips On How to Build Self Esteem In Your Child. Bringing positive change to levels of self esteem and softening the intensity of sibling rivalry is a long steady haul to healthier, happier relationships. And, as parents, our consistency counts. What are your thoughts? If you have any questions or comments about sibling envy please post them below. How To Be An Awesome Parent – 1 Vital Key by Parenting Expert Val Mullally. Every parent wants to be a ‘good parent’ – but what’s needed? I love this quote. It challenges me in my work as a soulpreneur and coach. But is it true when it comes to effective Parenting? What does it take to be the parent you want to be? If consistency leads to awesome results in the workplace is the same true for parenting? If I am consistent in my actions as a parent will I get consistent results? I’d love to believe it, but when it comes to parenting, whether you are parenting a toddler or parenting a teenager – think again! So – how to be a ‘Good Parent’? We can judge ourselves that we’re not being ‘good’ parents when things don’t go smoothly, but we need to hold in mind that we’re in the job for the long haul. There will be ups and downs, particularly as we move through times of change. Consistency in our parenting can be really hard. So does this mean, as parents, we should forget about consistency? No! Consistency matters if we want to be the parents our children need. Patience. Kindness. Awareness. Believing in your child. Does that mean you’ll see consistent parenting results? In the short term, probably not! You’ll still ride the roller coaster of everyday parenting, with all its wild ups and downs and unexpected corners. But in the long term, consistency pays off every time. Look around you and notice the families whose children have grown into fabulous young adults. Warm, caring, compassionate, responsible young people invariably have warm, caring, compassionate, responsible parents. We may have different parenting styles, but consistency always matters. consistency matters as much in the world of parenting as in the world of the entrepeneur. What three qualities or values do you choose to consistently model to your children? It doesn’t come by chance. It comes from a conscious decision. So now it’s your turn to challenge your online community. What three values did you choose? Please share your thoughts in the comments box below. Needing support to be the parent you want to be? Discover more about Parent Coaching. 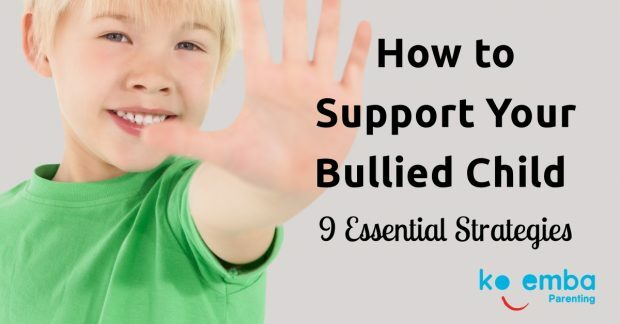 Whether your child is acting shy, or acting out, very often the underlying issue is self esteem. Now available four helpful blogs on Building Your Child’s Self Esteem by Parenting Expert Val Mullally . Join Parenting Expert Val Mullally in Moville this weekend. Grab this Autumn Promo now! Want to get a flavour of this awesome opportunity to discover key Parenting insights, tools and tips? to create happier home. Watch the free section now.